I have attended the launching of the two newest products of Dermplus, joining the skincare family of Dermplus Moisturizing Sunblock. The Dermplus Invisilite Sunblock Spray and Dermplus AfterSun Hydrating Body Gel. Have you ever wear sunblock who is invisible? A new suncare product comes in the form of Dermplus Invisilite Sunblock Spray. It is invisible on the skin when applied and it boasts of its total protection factor (TPF) 50++. Total protection factor is made up of Sun Protection Factor (SPF), moisturizer, and antioxidants to help shield skin from the harmful rays of the sun. It also keeps skin moisturized and dewy all day long. With its 2015 campaign, “Enjoy the Sun”, Dermplus Invisilite Sunblock Spray calls on everyone to step out under the sun and simply enjoy it. So, you don’t have to worry about the sun because you are sun-protected with Dermplus Invisilite. After the sun exposure you will even bother to worry about the sunburns and all because the refreshing and hydrating product for skin is here. Now is the perfect time to spot the perfect match for what you need. Dermplus is proud to introduce another latest product under its name. With the brand new Dermplus AfterSun Hydrating Body Gel, it instantly cools sun-exposed skin and can even soothe the hot and prickly feel of sunburns. The AfterSun gel is infused with aloe vera, cucumber, and chamomile extracts that aid in moisturizing dry, chapped skin all day even after the sun. With these two new products from Dermplus, you’ll surely make this sun-protected summer to remember. Dermplus Moisturizing Sunblock is available in all leading drugstores, supermarkets and department stores nationwide. For more information call 817 3303 or like them on Facebook. Dermplus Invisilite Sunblock Spary and Dermplus AfterSun Hydrating Body Gel are the quality products of JLC Miller & Co., Inc., an ISO 9001-2008 Certified Company. Neurobion launches the Neuropathy Awareness Movement in raising awareness about the prevalence of Neuropathy (nerve damage), its condition and the need for early intervention. In a recent study says that 1 out of 3 people may suffer from Neuropathy or nerve damage with progression age. A regular person can type 40 words per minute. On a normal day, a person takes 6,200 steps. With every touch, a person can ignite four million sensory receptors. These seemingly common daily activities will not be easy to perform without healthy nerves. Numbness, tingling and burning sensations, mostly felt in hands and feet, are common signs of nerve damage or a condition call Neuropathy. Contrary to the common belief that only old and mature people experience nerve damage, younger people can also experience and be prone to this condition. It can affect people who have an unbalanced diet and unhealthy lifestyle which includes smoking and high alcohol intake, those who have suffered injuries or have diabetes. But now, people can prevent nerve damage as early as they can by maintaining a balanced diet, following an active lifestyle and taking B-Vitamin Complex daily. The role of vitamins B1, B6, and B12 are important in the health of the nervous system. With this regards, the Neuropathy Awareness Movement takes proud with their advocacy. To reach out the younger market and more people, the brand engaged ambassadors for raising awareness includes the Director and Producer Paul Soriano and TV actress, singer and celebrity mom Zsa Zsa Padilla will help to spread the word about the campaign. Neurobion mission does not stop at providing preventive measure for Neuropathy but also extends to creating awareness and spreading information on teaching consumers how to detect early symptoms of the condition and how to live a healthy and active lifestyle. For more information on Neurobion and the Neuropathy Awareness Movement, visit www.facebook.com.NeurobionPhilippines. 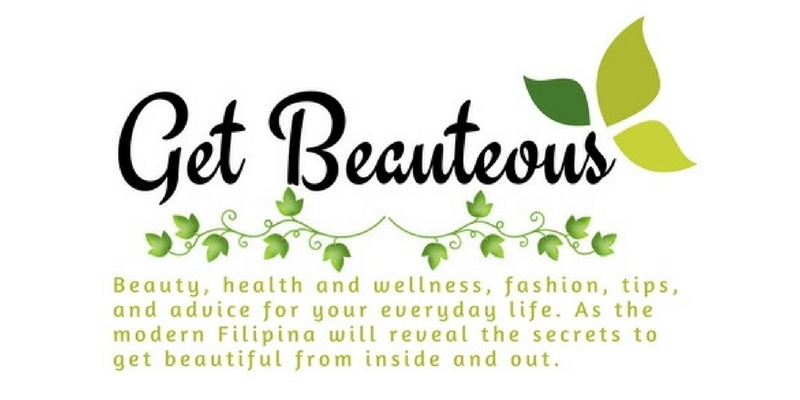 It was initiated by Captured Dream Entertainment Productions and they found the 40 young earth champions with the heart of service, love, humility and values of non-violence after months of searching for the Miss Teen Earth Philippines and Little Miss Earth Philippines. Today, as the leading pageant that provides World Class Beauty Pageants for young women. On its 2nd year, the Miss Teen Earth Philippines and Little Miss Earth Philippines promises to become bigger and brighter while staying true to its roots and its goal of uniting Filipinos to become active guardians of the environmental treasures of the Philippines. After the first leg of activities for this month of April, candidates will be sent to their home in their respective provinces so that they can start their chosen environmental advocacy. They must execute this advocacy in their local community before they all head back in Manila for he road to the coronation which will be televised again on GMA-7. To continue the journey of this young women, Captured Dream Entertainment Productions is believing in the beauty and potential of today's youth to make a difference and inspire change. For more information about the Miss Teen Earth Philippines and Little Miss Earth Philippines, visit www.missteenearth.ph and https://www.facebook.com/MissTeenEarthPH #EarthChampions #MTE2015 #LME2015. It was such a privilege to be invited for a small talk about money matters. We spend money here, there and everywhere without telling ourselves and knowing when to stop until we are broke and have so many debts. I personally don't practice of having debt. I simply don't like the idea and for me it's better to maximize everything I have than to loan to someone. Many Filipinos are into debts and they having a hard time dealing with it. In most cases, they hide to people whom they have debts. Let's end that scenario instead find ways how to improve yourself in handling money so that you will be FREE on DEBTS. In that case, I will help you to nurture your minds on how to do it because I find something called "Money Kit" where it can teach you the step by step on how to be Free on Debts. Its simple, applicable and attainable! Till Debt Do Us Part Book - its Chinkee Tan's book that will help you on basic savings, budgeting, investing and debt free. Chink Positive DVD Guide - it's Chinkee Tan’s video that can guide you on your personal money. Budgeting Software - this automated software will help you to keep track your personal money and expenses. Chink Positive Money Kit Manual - this will guide you and teach you the step-by-step process on how to start your financial journey. Chink Positive Debt Repayment Plan Worksheet - this will guide you n how to reduce your debt. Chink Positive Financial Obligation Worksheet - this will help you to know who and what to prioritize in spending. Chink Positive Accordion Folder - it will help you organize and divide your monthly expenses. Chink Positive Saving Envelope - it will help you to start savings with the little money you have. Chink Positive Investment Envelope - it will help you to set and achieve your financial goals as well as how to make your money grow. Now you know what's inside the Money Kit, I'm pretty sure that you are thinking of How much is the cost of this kit? Oh well, the Money Kit is for only Php2,500 and because Chinckee Tan is so generous, he will give you a FREE COPY of ALL HIS 5 BOOKS! which is Php300-400 per book or Php2,000 when you buy it in the bookstore. Fantastic right! Moreover, Chinkee Tan's books are also available in all National Bookstore. But wait, Chinkee Tan is giving away huge discounts on his books. If you buy 4 books you will get 1 FREE Book for only Php1,250 and you can buy 3 books for the price of Php900. Remember the regular cost of the book is Php300-400 pesos. 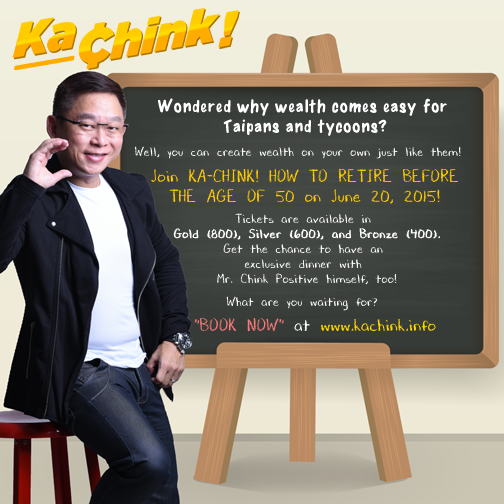 Also, The wealth and life coach, Chinkee will be having a conference on June 20, 2015, Saturday, 1:00pm – 6:00 pm at the Metrowalk Plaza, Meralco Ave., Pasig. They offer less P1,000.00 promo for those who will register early. 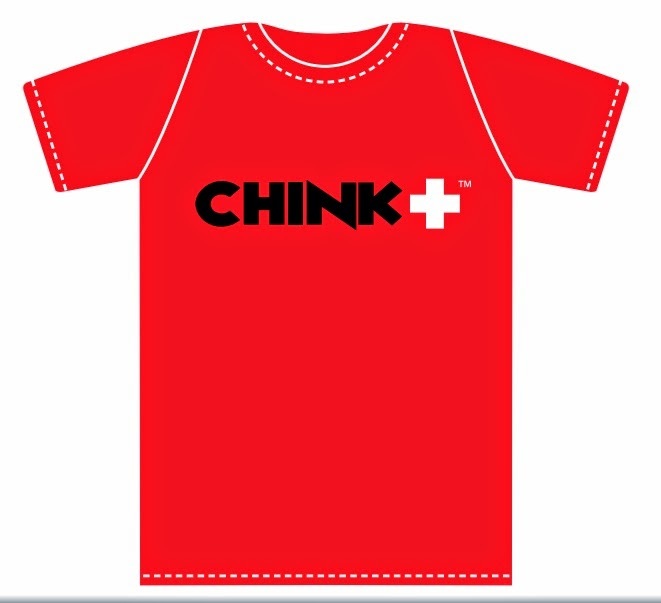 You will also get FREE T-Shirt from Chinkee Tan when you purchase the Money Kit. Just fill up the Form below to get your Freebies! Reserve now and to receive an opted in confirmation email to make sure that you are not being added without consent. Once you confirm, you will get an email to the links of Chinkee Tan's book and training programs. Always remember that sometimes you need to invest in order for you to learn new knowledge and knowledge is power... and it's not for free. If you want to receive the give-away being offered on this blog, just fill up this form to reserve (DO THIS FIRST). You will receive an opt-in confirmation email to ensure you are not being added without your consent. Once you confirm, you will get an email that has the links to purchase Chinkee Tan's books and training programs. Last 31 March 2015 at Merrell Concept Store, Market! Market! Bonifacio Global City in a media briefing for Pro Earth Run 2015, Dr. Metodio Palaypay underscored the critical role of media in bringing out the message of earth care to the public when he addressed the press and bloggers. “The future of humanity is everyone’s responsibility. This is why we never get tired of telling people that Earth Day must be everyday, everywhere, for everyone,” - Dr. Metodio Palaypay, Earth Day Network Philippines Chairman. Meanwhile, DENR Director for Strategic Communication and Initiatives Service Jesus Enrico Moises Salazar commended Earth Day Network Philippines for the environmental work it has been doing over the years. “While the result of your labor may not always be immediately felt, it will eventually yield something good for the country.” - Jesus Enrico Moises Salazar, DENR Director for Strategic Communication and Initiatives Service. Earth Day Network Philippines is at the forefront of the annual worldwide April 22nd Earth Day Celebration. It actively engages the participation of people from government, corporate, religious, and academic institutions to rally together behind environmental protection, preservation, and promotion. Now on its second year, Earth Day Network Philippines stages Pro Earth Run 2015 to encourage people to take active lead in protecting, respecting, and overseeing Earth care by running the race for Mother Earth. Happening on 25 April 2015, Saturday, 4:30AM, at the Mall Of Asia MOA Grounds in Pasay City, proceeds of the 3K/5K/10K advocacy run will fund the continuing projects and programs of Earth Day Network Philippines such as Watershed Restoration and Forest Conservation, Re-Charge Tacloban, Zero Basura Olympics, and Mini Carbon Olympics. Pro Earth Run 2015 tickets are available at SM Ticket counters nationwide until April 19 and at Merrell Concept Stores in SM North Edsa Annex, Trinoma, Festival Mall, and Market! Market! until April 15. Registration is until April 20 via www.earthdayphilippines.org. Presented by Earth Day Network Philippines, in cooperation with the Department of Environment and Natural Resources (DENR), United Parcel Services (UPS), and SM Cares, the Pro Earth Run 2015 is supported by Xend, Official Courier Partner; The Medical City, Official Medical Partner; Greenlite Banner (The Reusable Banner), Official Printing Partner; Merrell, Official Shoe Sponsor; Maynilad, Official Hydration Partner; Canon; Timex, Official Timing Partner; Slimmers World, Official Fitness Partner; Gerry’s Grill and Uncle Cheffy, Food Sponsors; Kabayan Hotel, Air Asia, Rudy Project, and Integrated Waste Management Inc. Pro Earth Run 2015 is also supported by GMA7, GMA News TV, 97.9 Home Radio,106.7 Energy FM, 99.5 Play FM, Business Mirror, Malaya Business Insight, and out-of-home-media specialist, United Neon. 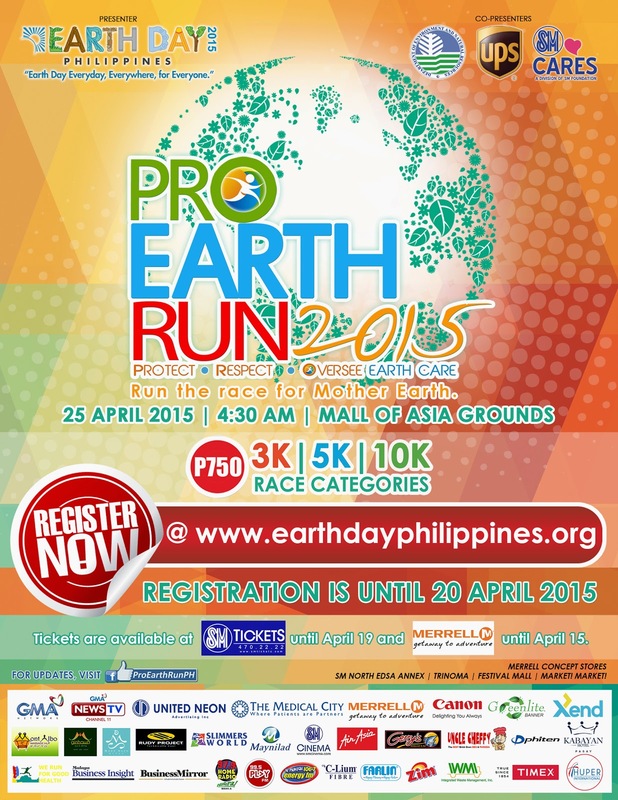 Details on Pro Earth Run 2015 are posted on www.facebook.com/ProEarthRunPH.